In Vermont, if you're a teenager, the Department of Motor Vehicles (DMV) requires that you obtain a learner's permit before you can apply for your driver's license. This is a requirement of the graduated driver license (GDL) program, which is designed to help you become a safe and responsible driver. Your Vermont learner's permit will allow you to practice driving while supervised and ensure you have the skills and knowledge necessary to pass your road test. If you have recently moved to Vermont and have an out-of-state learner's permit, contact the Vermont DMV directly to see if you're eligible to transfer it. 30 hours of classroom study. Provide proof you have completed at least 40 hours of driving practice. You must follow the rules and restrictions of the Vermont GDL program. For information about transferring your regular out-of-state driver's license, see our Applying for a New License (Drivers 18+) in Vermont page. If you're under 18 years old and applying for your first driver's license, you will need to first obtain your learner's permit. You must be at least 15 years old to do so. Complete the Application for License/Permit (Form VL-021). You parent or legal guardian must sign the form. Provide proof of your identity, age, and lawful U.S. status (e.g. valid, unexpired U.S. passport, Certified copy of birth certificate). Provide proof of your Social Security number (e.g. Social Security card, W-2 form). Submit 2 documents proving your Vermont residency and current residential address (e.g. utility bill, property tax bill). As a minor, it’s tough to prove residency. So, the VT DMV will accept the Vermont Residency Certification (Form VL-002) AND another proof of residency from your parent(s)/legal guardian(s) such as a utility bill, property tax bill, or homeowner or renter insurance policy. Show proof of any name changes, if applicable (e.g. marriage certificate, divorce decree, or other court document). Pay the $20 learner's permit fee and $32 examination fee. For a complete list of documents proving your identity, SSN, and residency, visit the VT Department of Motor Vehicles website. The VT DMV issues REAL ID-compliant driver’s licenses and permits to all eligible applicants (i.e. those who provide all required documents listed above). However, Vermont residents who are also legal U.S. citizens can opt for an Enhanced Driver’s License (EDL) instead. The EDL meets all REAL ID requirements, but it also acts like a passport for travel to Canada, Mexico, and the Caribbean. Review the Vermont REAL ID Checklist(Form TA-VL-91) AND the Enhanced License/ID Information (Form VL-18) to make sure you have all required documents before you head to the DMV. Bring your parent(s)/legal guardian(s) to the DMV if you’re younger than 18 years old. Be prepared to pay both the $20 fee for your driver permit AND the additional $30 fee for your EDL. After you apply—and are found eligible—you’ll receive a temporary EDL; you cannot use a temporary EDL to cross borders. You should receive your permanent EDL within 2 weeks. Although making an appointment at the Vermont DMV is not required for your written permit tests, it is recommended. To make an appointment, simply call (802) 828-2000. The written permit will consist of 20 questions (multiple choice). You must answer 16 questions correctly to pass. If you fail, you must wait 1 day before you can take the test again. 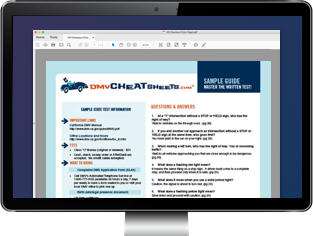 To help you prepare for the written test, the DMV offers an interactive tutorial. We also suggest preparing with an online practice test from our approved partner. With your learner's permit in your possession you are allowed to practice driving as long as you are accompanied by your licensed, unimpaired parent or guardian who is at least 25 years old. Your supervisor must be seated in the front passenger seat. Before you can move on to the next step of the GDL process and obtain your junior operator's license, you must complete both Driver's Ed AND supervised driving practice. Your supervised driving practice must total at least 40 hours, including 10 hours at night. Nighttime is classified as 30 minutes following sunset to 30 minutes before sunrise. NOTE: Visit our Driver's Ed in Vermont page to learn more about the driver's education requirement. Successfully completed a Driver's Ed course. Completed your required behind-the-wheel driving hours. You must have had a clean driving record for the past 6 months. For more information on applying for your first driver's license, see our Applying for a New License (Teen Drivers) in Vermont page. Information for an enhanced Vermont driver's license.